How's Your Boiler Doing? 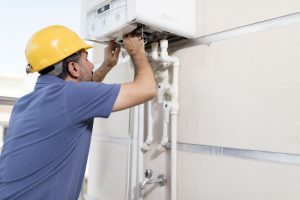 4 Classic Signs You Need Repair | Atlantic Refrigeration and Air Conditioning, Inc.
Boilers can last for about two decades. If that’s the case with yours, then it may be natural that your system has a pilot light. The issue with these old things is that they must be burning all night and day—it’s not uncommon for them to need relighting or to need replacement entirely. Alternatively, newer boilers use an electronic ignition system. These save energy and are much more reliable, but even they can need replacement at times. If you’re fond of drinking tea, you’re undoubtedly familiar with the faint rumbling and rattling noises that you can hear as the hot water gets closer to being ready. When your boiler is filled with too many mineral deposits from hard water, it can change the pressure levels in the tank. Not only does this make for some troublesome noises, but it can eventually cause the tank to spring a leak. Consider kettling to be a convenient warning sign that your boiler needs maintenance! Cross your fingers, because a boiler leak can either be the worst possible thing or it might be nothing at all. If your boiler’s tank has sprung a leak, there’s nothing you can do but to have it replaced. It’s much easier to avoid a leak if the boiler is maintained and regularly has mineral deposits flushed from it. On the other hand, it could be an issue with your pumps or pressure relief valves. Luckily, these can be repaired without much trouble. The best-case scenario is that your “leak” is actually just a buildup of condensation. A boiler is a machine, just like any heating system. And as machines age, they tend to decline in performance. That lack of performance will manifest as an increase in your heating bill. If your boiler is under 15 years old, then the best solution for this problem is regular maintenance. By having your boiler maintained every year before the winter, we can get its efficiency back up and drive those costs down. However, if your boiler is too old, it might be too late for maintenance. It might be better to replace the system. Of course, we don’t expect you to make that decision on your own, so please don’t hesitate to contact a professional of heating in Delaware. Don’t wait any longer for your boiler maintenance! Contact Atlantic Refrigeration & Air Conditioning, Inc. today to schedule a service.